: Health insurance for women can ensure protection for not only themselves, but also their loved ones. And it can provide a more secure financial future. From finance to entrepreneurship, politics to technology, women are bringing about changes in the world, alongside men. Over the last few decades, women have slowly, but surely, forged their way into areas that have traditionally been considered “male dominated”. Looking at the relationship between Women and Money in India, however, you may think otherwise. Only 13% of married working women take their own investment decisions, and the figure is only slightly higher (18%) for single working women. Sadly, the scenario isn’t much better in the case of insurance, be it life or health. In fact, studies show that women account for only 30% of health and life insurance policyholders in India. They depend on another for their financial needs- but what happens if they have to fend for themselves? They would rather save up for more likely, more important life events- but what happens if a major disease strikes, and all that money vanishes overnight? They think it’s alright to delay- but what about waiting period? Did you know that usually, maternity health policies have a waiting period of 5 years before you can claim? They don’t feel they are at as much risk as men- but what about these stats? A study in 2014 revealed that 3 in 5 Women in India are at high risk of cardiovascular disease as early as 35 years of age, and that number has only increased since then. When it comes to insurance, coverage for non-working spouses is often overlooked, especially if the household is in a lower income bracket. But a non-working spouse, whether woman or man, handles a variety of tasks- from cooking and cleaning, to managing budgets and finances, to taking care of the kids. In case this spouse takes ill and is unable to contribute, you would need to hire multiple people to manage these tasks for the family. This would increase your outflow of expenses by a large amount. If you don’t have health insurance, you would need to dig into your life’s savings to pay for these additional resources AND for medical care for your spouse, which could seriously derail your financial stability. Women, especially homemakers, are usually covered as a dependant under their spouse’s health plan or under group medi-claim that may be provided by their spouse’s employer. However, research shows that women use more health care services as compared to men, as they have longer lives, are more prone to chronic illnesses and require reproductive care. For instance, studies show that about 38% of women are at a risk of chronic illness as opposed to 30% of men. Yet, less than 40% women have health cover; and only about 22% of that number have individual insurance policies. In addition, a woman risks losing whatever health cover she has as a dependant on her spouse’s group medi-claim, if her husband loses his job. On the other hand, as a dependant on someone else’s cover, she may not be eligible for several benefits that an individual health cover might offer. How much money can Health Insurance save you? By investing in a health insurance policy, women ultimately invest in themselves, and this can offer better health care for a prolonged life. To improve the quality of life for women, many insurance providers have created policies that address women-specific health conditions. Having health insurance to fall back on, ensures women have the necessary financial help to treat specified conditions if they ever face them, without worrying about costs. Some insurance policies also encourage routine check-ups, which can catch health issues before they become serious. Fortunately, the future of insurance for women is looking good. 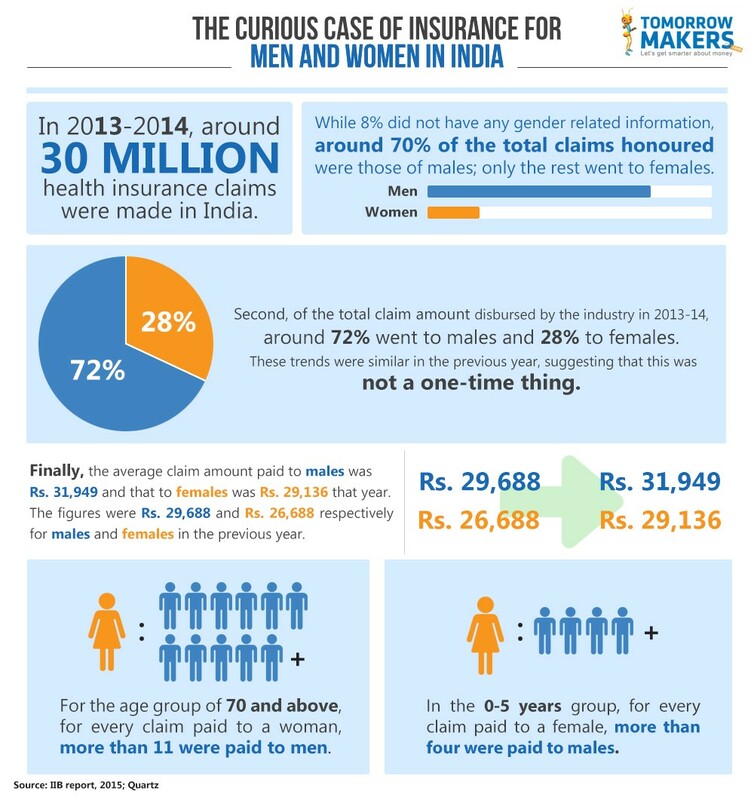 The insurance market for women in India is expected to increase to $35 billion by 2030. And women show a higher inclination towards protection and prevention, making them more likely to buy insurance as a means of protecting those they love. Whether married or single, women will almost always have a dependant- husband, children, parents or siblings. To ensure they are around to look after their loved ones, women must care for their own health as well. And choosing a suitable health plan, with the right covers is what can make this happen.